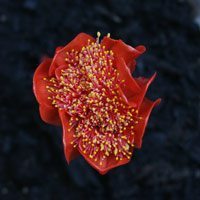 With fascinating flowers that are best described as looking like a paintbrush, Haemanthus, follow up with some fairly exotic foliage as well. Easy to grow in a well drained soil they make a great feature plant in garden or container. Haemanthus species such as Haemanthus coccineus (picture right), albiflos and multiflorus are from South Africa and neighbouring countries. Flowers are reminiscent of a brush head, with red , yellow and white species. Haemanthus are best grown in a pot, but are worth a try in the rock garden, a free draining potting mix is best and try not to over water. 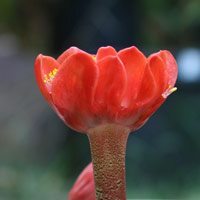 During dormancy do not water haemanthus at all. H. albiflos, is probably the easiest to grow followed by H. coccineus.